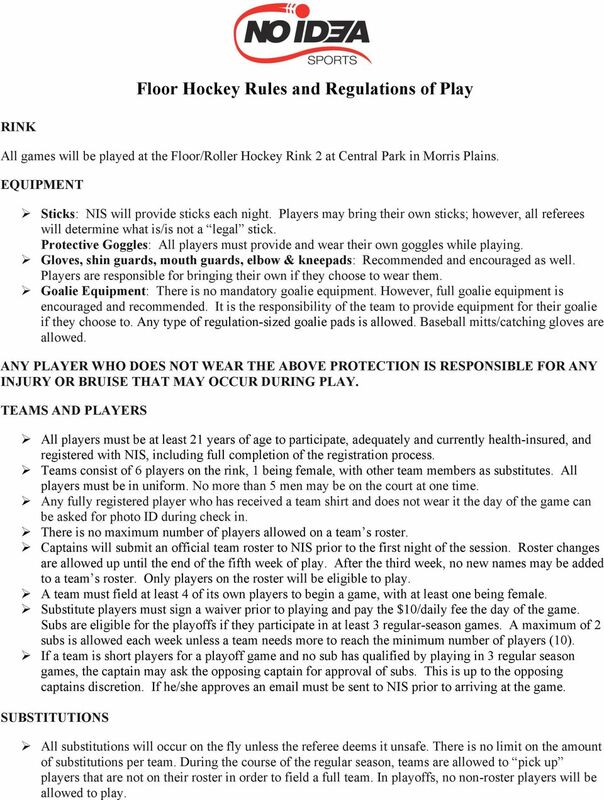 Download "Floor Hockey Rules and Regulations of Play"
1 Floor Hockey Rules and Regulations of Play RINK All games will be played at the Floor/Roller Hockey Rink 2 at Central Park in Morris Plains. EQUIPMENT Ø Sticks: NIS will provide sticks each night. Players may bring their own sticks; however, all referees will determine what is/is not a legal stick. Protective Goggles: All players must provide and wear their own goggles while playing. Ø Gloves, shin guards, mouth guards, elbow & kneepads: Recommended and encouraged as well. Players are responsible for bringing their own if they choose to wear them. Ø Goalie Equipment: There is no mandatory goalie equipment. However, full goalie equipment is encouraged and recommended. It is the responsibility of the team to provide equipment for their goalie if they choose to. Any type of regulation-sized goalie pads is allowed. Baseball mitts/catching gloves are allowed. ANY PLAYER WHO DOES NOT WEAR THE ABOVE PROTECTION IS RESPONSIBLE FOR ANY INJURY OR BRUISE THAT MAY OCCUR DURING PLAY. TEAMS AND PLAYERS Ø All players must be at least 21 years of age to participate, adequately and currently health-insured, and registered with NIS, including full completion of the registration process. Ø Teams consist of 6 players on the rink, 1 being female, with other team members as substitutes. All players must be in uniform. No more than 5 men may be on the court at one time. Ø Any fully registered player who has received a team shirt and does not wear it the day of the game can be asked for photo ID during check in. Ø There is no maximum number of players allowed on a team s roster. Ø Captains will submit an official team roster to NIS prior to the first night of the session. Roster changes are allowed up until the end of the fifth week of play. After the third week, no new names may be added to a team s roster. Only players on the roster will be eligible to play. Ø A team must field at least 4 of its own players to begin a game, with at least one being female. Ø Substitute players must sign a waiver prior to playing and pay the $10/daily fee the day of the game. Subs are eligible for the playoffs if they participate in at least 3 regular-season games. A maximum of 2 subs is allowed each week unless a team needs more to reach the minimum number of players (10). Ø If a team is short players for a playoff game and no sub has qualified by playing in 3 regular season games, the captain may ask the opposing captain for approval of subs. This is up to the opposing captains discretion. If he/she approves an must be sent to NIS prior to arriving at the game. SUBSTITUTIONS Ø All substitutions will occur on the fly unless the referee deems it unsafe. There is no limit on the amount of substitutions per team. During the course of the regular season, teams are allowed to pick up players that are not on their roster in order to field a full team. In playoffs, no non-roster players will be allowed to play. 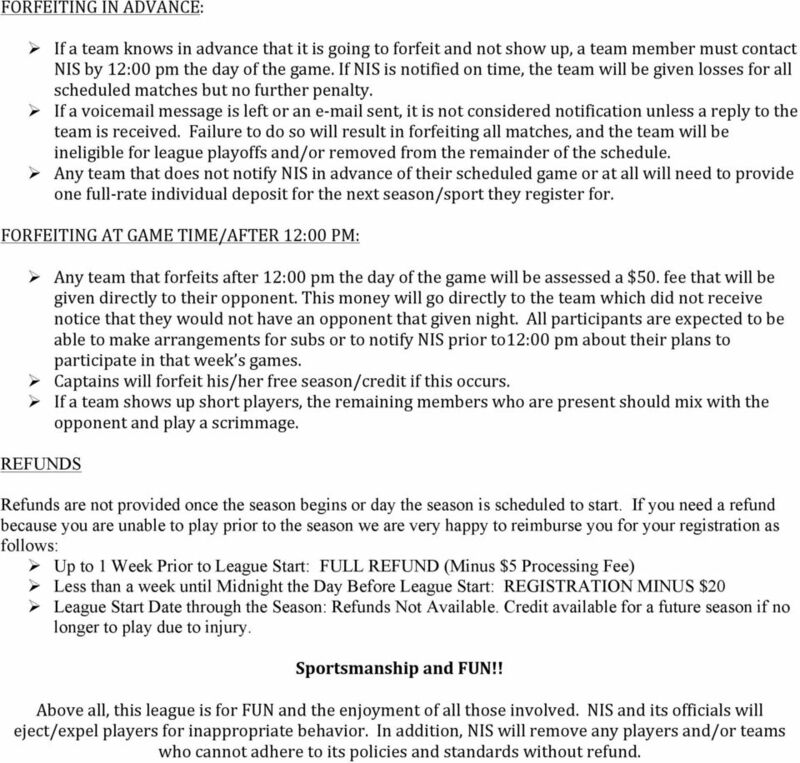 2 ROSTER REQUIREMENTS Ø Captains will submit an official team roster to NIS prior to the first night of the session. Roster changes are allowed up until the end of the third week of play. After the third week, no new names may be added to a team s roster. Only players on the roster will be eligible to play. Ø All teams must have a minimum of 7 fully registered players for the season. Ø If a team is short the minimum number of fully registered players by the start of their game for week 3 they will automatically forfeit that game. This rule applies for week 4 and 5 as well. Ø If a team is still short the minimum number of fully registered players at the end of their week 5 game (end of the regular season) the teams season will end and will be removed from the final 3 weeks of the league schedule. GAME PLAY Ø Regulation Games will consist of (3) 15-minute periods separated by a 1 minute break. There will be a running clock throughout the game. The referee will maintain a running clock. Each team is granted (2)- 30 second timeouts per game. Ø Games are played 5-on-5 plus a goalie for a total of 6 players on the floor for each team. 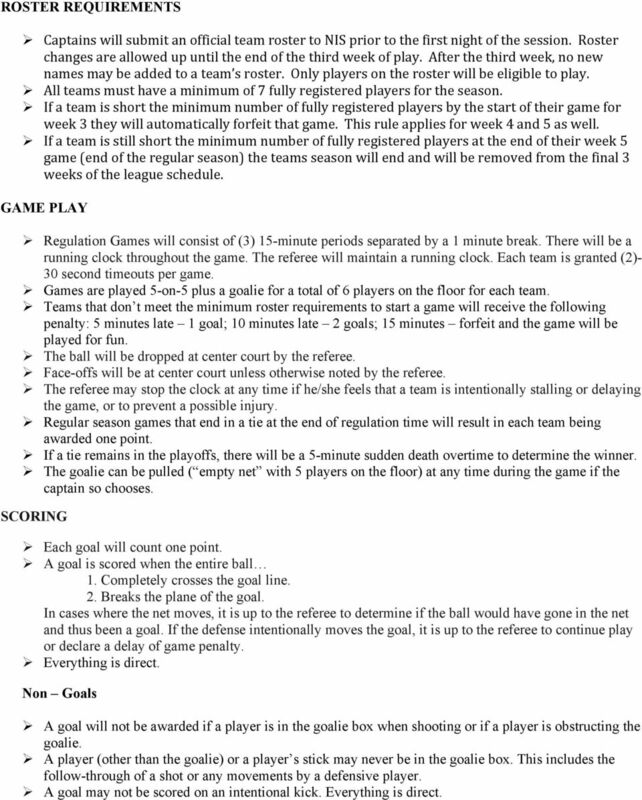 Ø Teams that don t meet the minimum roster requirements to start a game will receive the following penalty: 5 minutes late 1 goal; 10 minutes late 2 goals; 15 minutes forfeit and the game will be played for fun. Ø The ball will be dropped at center court by the referee. Ø Face-offs will be at center court unless otherwise noted by the referee. Ø The referee may stop the clock at any time if he/she feels that a team is intentionally stalling or delaying the game, or to prevent a possible injury. Ø Regular season games that end in a tie at the end of regulation time will result in each team being awarded one point. Ø If a tie remains in the playoffs, there will be a 5-minute sudden death overtime to determine the winner. Ø The goalie can be pulled ( empty net with 5 players on the floor) at any time during the game if the captain so chooses. SCORING Ø Each goal will count one point. Ø A goal is scored when the entire ball 1. Completely crosses the goal line. 2. Breaks the plane of the goal. In cases where the net moves, it is up to the referee to determine if the ball would have gone in the net and thus been a goal. If the defense intentionally moves the goal, it is up to the referee to continue play or declare a delay of game penalty. Ø Everything is direct. Non Goals Ø A goal will not be awarded if a player is in the goalie box when shooting or if a player is obstructing the goalie. Ø A player (other than the goalie) or a player s stick may never be in the goalie box. This includes the follow-through of a shot or any movements by a defensive player. Ø A goal may not be scored on an intentional kick. Everything is direct. 3 MERCY RULE Ø If a team reaches a lead of 7 goals in a game, the score will freeze at that time, and the two teams may continue to play for fun with no further recording of goals. BALL TRAPS/HAND PASSES Ø The ball may be hit (OR CAUGHT) or blocked with an open hand down to the floor. Ø The ball cannot be advanced with the hands. Ø Play will not be stopped unless the player has directed the ball (in any manner) using a hand to a teammate who is in the neutral or attacking zone. If this occurs, play will be ruled dead and a face-off will occur. Ø Goalies are also not allowed to throw the ball to a teammate who is outside the defending zone. Ø A minor penalty will be given to any player that closes a hand on the ball with intent (as judged by the referee) to delay the game or intentionally force a stoppage of play. Ø A penalty shot will be awarded to the other team if a player closes a hand on the ball in his/her goalie's crease. 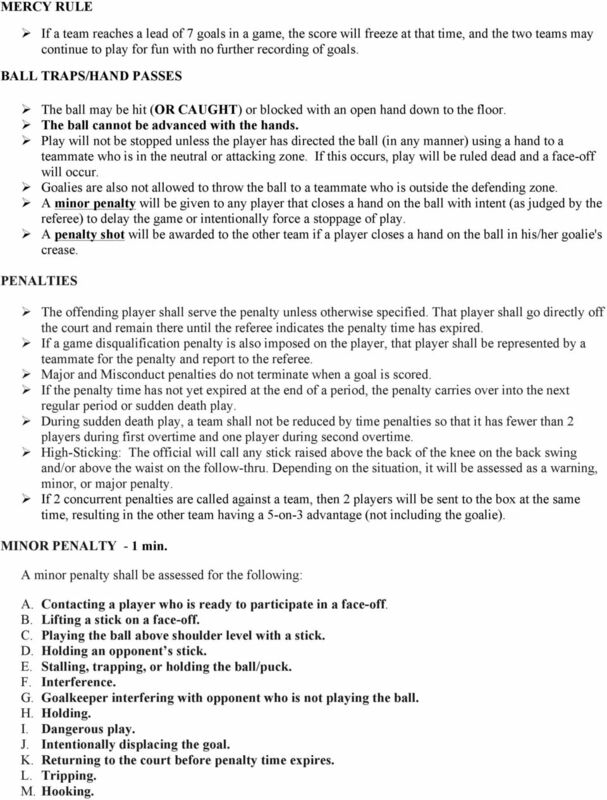 PENALTIES Ø The offending player shall serve the penalty unless otherwise specified. That player shall go directly off the court and remain there until the referee indicates the penalty time has expired. Ø If a game disqualification penalty is also imposed on the player, that player shall be represented by a teammate for the penalty and report to the referee. Ø Major and Misconduct penalties do not terminate when a goal is scored. Ø If the penalty time has not yet expired at the end of a period, the penalty carries over into the next regular period or sudden death play. Ø During sudden death play, a team shall not be reduced by time penalties so that it has fewer than 2 players during first overtime and one player during second overtime. Ø High-Sticking: The official will call any stick raised above the back of the knee on the back swing and/or above the waist on the follow-thru. Depending on the situation, it will be assessed as a warning, minor, or major penalty. 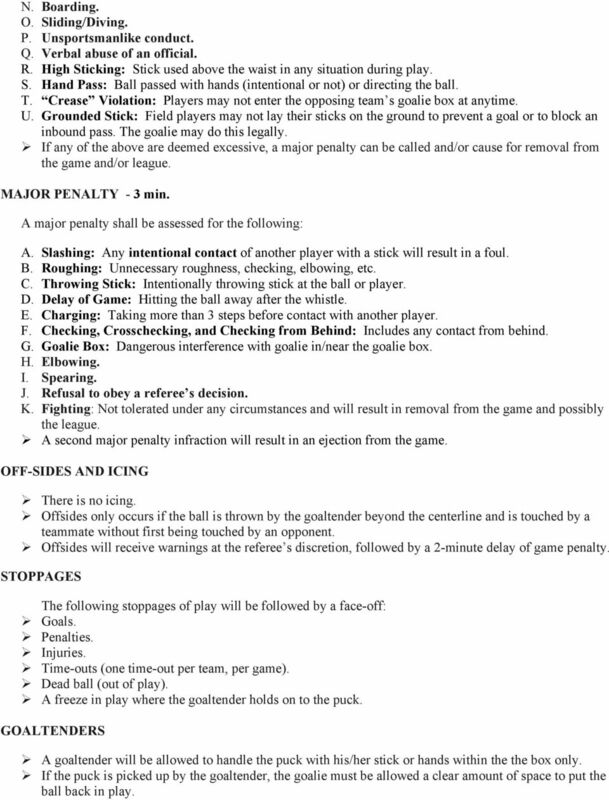 Ø If 2 concurrent penalties are called against a team, then 2 players will be sent to the box at the same time, resulting in the other team having a 5-on-3 advantage (not including the goalie). MINOR PENALTY - 1 min. A minor penalty shall be assessed for the following: A. Contacting a player who is ready to participate in a face-off. B. Lifting a stick on a face-off. C. Playing the ball above shoulder level with a stick. D. Holding an opponent s stick. E. Stalling, trapping, or holding the ball/puck. F. Interference. G. Goalkeeper interfering with opponent who is not playing the ball. H. Holding. I. Dangerous play. J. Intentionally displacing the goal. K. Returning to the court before penalty time expires. L. Tripping. M. Hooking. 4 N. Boarding. O. Sliding/Diving. P. Unsportsmanlike conduct. Q. Verbal abuse of an official. R. High Sticking: Stick used above the waist in any situation during play. S. Hand Pass: Ball passed with hands (intentional or not) or directing the ball. T. Crease Violation: Players may not enter the opposing team s goalie box at anytime. U. Grounded Stick: Field players may not lay their sticks on the ground to prevent a goal or to block an inbound pass. The goalie may do this legally. Ø If any of the above are deemed excessive, a major penalty can be called and/or cause for removal from the game and/or league. MAJOR PENALTY - 3 min. A major penalty shall be assessed for the following: A. Slashing: Any intentional contact of another player with a stick will result in a foul. B. Roughing: Unnecessary roughness, checking, elbowing, etc. C. Throwing Stick: Intentionally throwing stick at the ball or player. D. Delay of Game: Hitting the ball away after the whistle. E. Charging: Taking more than 3 steps before contact with another player. F. Checking, Crosschecking, and Checking from Behind: Includes any contact from behind. G. Goalie Box: Dangerous interference with goalie in/near the goalie box. H. Elbowing. I. Spearing. J. Refusal to obey a referee s decision. K. Fighting: Not tolerated under any circumstances and will result in removal from the game and possibly the league. Ø A second major penalty infraction will result in an ejection from the game. OFF-SIDES AND ICING Ø There is no icing. Ø Offsides only occurs if the ball is thrown by the goaltender beyond the centerline and is touched by a teammate without first being touched by an opponent. Ø Offsides will receive warnings at the referee s discretion, followed by a 2-minute delay of game penalty. STOPPAGES The following stoppages of play will be followed by a face-off: Ø Goals. Ø Penalties. Ø Injuries. Ø Time-outs (one time-out per team, per game). Ø Dead ball (out of play). Ø A freeze in play where the goaltender holds on to the puck. GOALTENDERS Ø A goaltender will be allowed to handle the puck with his/her stick or hands within the the box only. Ø If the puck is picked up by the goaltender, the goalie must be allowed a clear amount of space to put the ball back in play. 5 Ø A goalie may call for a freeze of play in which case the ball will be turned over to the referee and a face off will ensue at center ice. Ø If the goalie is clearly delaying in putting the puck in play, the referee may stop the clock at his/her discretion and have a face-off or, if it persists, it will be a delay of game penalty. Ø The goaltender can put the ball back in play by rolling it to a teammate on his/her side of mid-court or passing the puck with his/her stick. Ø Offensive players may not enter the crease without the ball or without the ball being in the crease. This is interference. Ø The goalie may throw the ball after a save or when the opposing team hits the ball over the end line. When throwing the ball, the goalie must keep at least one foot in the goalie box. The ball must be thrown underhand, not sidearm, or kicked and remain below waist level through its flight. Ø Crease Rule: Goalies may come out of their crease to play the ball, but cannot cover it if they are out of the crease. Offensive players are not allowed to stand in the crease to obstruct the goalie s view or movement. Ø Goalie Possession of Ball: Players may not hit or hack the goalie while they are trying to glove the ball in the crease. Goalies cannot cover nor freeze the ball if they are not in the crease. Ø Goalie Rules: Goalies are not allowed to pass the centerline during play. A goalie throwing his/her stick will result in a penalty shot for the other team. UNSPORTSMANLIKE CONDUCT Ø If a player bumps an opponent or accidentally trips him/her, the player must check to see if the opponent is okay, help the opponent up, and let him/her know it was an accident. If the player does not, it will be assumed that the individual did it on purpose; this will result in a 2-minute penalty for unsportsmanlike behavior. If players are battling hard for the ball, the play will not get called down immediately if the players appear to be respecting each other and sportsmanlike behavior is shown after the play. If a player runs into and bumps another player and then continues to run, a penalty will be called. Ø Unsportsmanlike-like conduct will not be tolerated. Players will be ejected from a game for deliberate roughness or unsportsmanlike-like conduct. HIGH STICKS Ø At no time should the blade go higher than crossbar level. This includes calling for the pass, trying to knock it down out of the air, running down the floor, and slap shots (including follow- through). BODY INTERFERENCE Ø A player may not use his/her body or back to bulldoze through people. Ø A player may not use his/her body to prevent an opponent from passing by him/her, such as jumping in front of them. Ø A player may not take one hand off his/her stick and give another player a shove with his/her free hand. A player cannot wrap his/her arms around an opponent or use a free hand to clutch, grab, or hold the stick, jersey, or body on the opponent in a manner that impedes his/her progress. Examples include wrapping one or both arms around the opponent along the boards in a manner that pins them against the boards (preventing them from playing the ball or running); grabbing the opponent s body, stick, or shirt with one or both hands. SLIDING Ø A player is NOT allowed to slide under any circumstances, including in an attempt to reach the ball or steal the ball from another player. With the exception of the goalie, no player can slide or dive to block a shot. 6 TRIPPING Ø A player or goalkeeper is not allowed to place a stick or any body part in such a manner that causes his/her opponent to trip or fall. A penalty shot will be awarded to the other team if a player trips an opponent from behind while the opponent is in control of the ball on a breakaway. AGGRESSIVE OR THREATENING BEHAVIOR Ø Verbal or physical abuse of other players or the referee will absolutely NOT be tolerated. 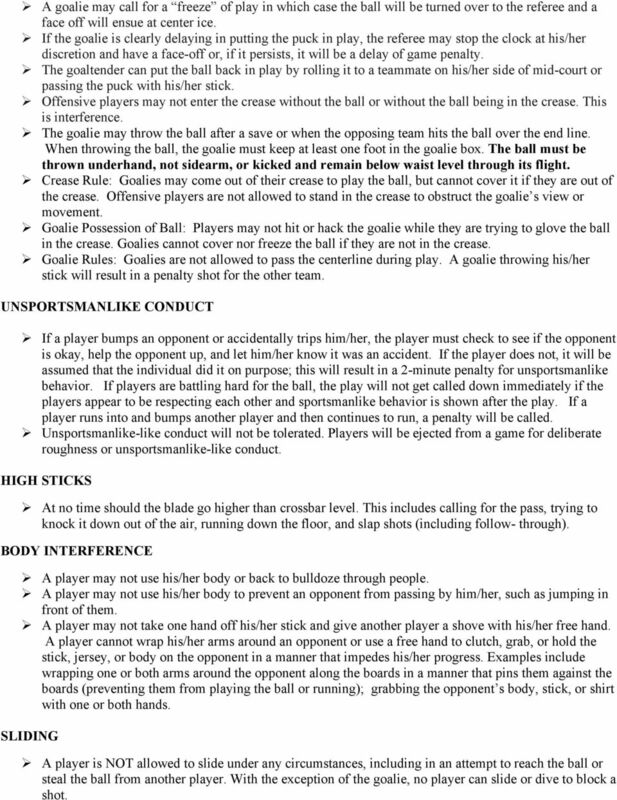 This includes obvious and directed roughness against another player. WINNING THE GAME Ø The team with the higher score at the end of 45 minutes of play will be deemed the winner. Ø If there is a tie at the end of regulation and time allows there will be shootout to determine the winner. The shootout will be best of 5 with the 3 rd shooter being female. PLAYOFFS Ø All roster players are allowed to participate in the playoffs. 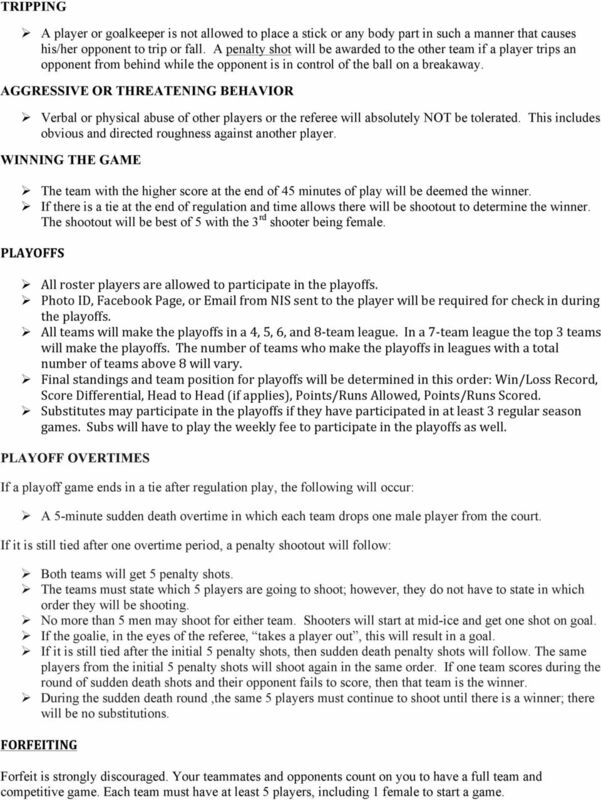 Ø Photo ID, Facebook Page, or from NIS sent to the player will be required for check in during the playoffs. Ø All teams will make the playoffs in a 4, 5, 6, and 8-team league. In a 7-team league the top 3 teams will make the playoffs. The number of teams who make the playoffs in leagues with a total number of teams above 8 will vary. Ø Final standings and team position for playoffs will be determined in this order: Win/Loss Record, Score Differential, Head to Head (if applies), Points/Runs Allowed, Points/Runs Scored. Ø Substitutes may participate in the playoffs if they have participated in at least 3 regular season games. Subs will have to play the weekly fee to participate in the playoffs as well. PLAYOFF OVERTIMES If a playoff game ends in a tie after regulation play, the following will occur: Ø A 5-minute sudden death overtime in which each team drops one male player from the court. If it is still tied after one overtime period, a penalty shootout will follow: Ø Both teams will get 5 penalty shots. Ø The teams must state which 5 players are going to shoot; however, they do not have to state in which order they will be shooting. Ø No more than 5 men may shoot for either team. Shooters will start at mid-ice and get one shot on goal. Ø If the goalie, in the eyes of the referee, takes a player out, this will result in a goal. Ø If it is still tied after the initial 5 penalty shots, then sudden death penalty shots will follow. The same players from the initial 5 penalty shots will shoot again in the same order. If one team scores during the round of sudden death shots and their opponent fails to score, then that team is the winner. Ø During the sudden death round,the same 5 players must continue to shoot until there is a winner; there will be no substitutions. FORFEITING Forfeit is strongly discouraged. Your teammates and opponents count on you to have a full team and competitive game. Each team must have at least 5 players, including 1 female to start a game. 7 FORFEITING IN ADVANCE: Ø If a team knows in advance that it is going to forfeit and not show up, a team member must contact NIS by 12:00 pm the day of the game. If NIS is notified on time, the team will be given losses for all scheduled matches but no further penalty. Ø If a voic message is left or an sent, it is not considered notification unless a reply to the team is received. Failure to do so will result in forfeiting all matches, and the team will be ineligible for league playoffs and/or removed from the remainder of the schedule. Ø Any team that does not notify NIS in advance of their scheduled game or at all will need to provide one full-rate individual deposit for the next season/sport they register for. FORFEITING AT GAME TIME/AFTER 12:00 PM: Ø Any team that forfeits after 12:00 pm the day of the game will be assessed a $50. fee that will be given directly to their opponent. This money will go directly to the team which did not receive notice that they would not have an opponent that given night. All participants are expected to be able to make arrangements for subs or to notify NIS prior to12:00 pm about their plans to participate in that week s games. Ø Captains will forfeit his/her free season/credit if this occurs. Ø If a team shows up short players, the remaining members who are present should mix with the opponent and play a scrimmage. REFUNDS Refunds are not provided once the season begins or day the season is scheduled to start. If you need a refund because you are unable to play prior to the season we are very happy to reimburse you for your registration as follows: Ø Up to 1 Week Prior to League Start: FULL REFUND (Minus $5 Processing Fee) Ø Less than a week until Midnight the Day Before League Start: REGISTRATION MINUS $20 Ø League Start Date through the Season: Refunds Not Available. Credit available for a future season if no longer to play due to injury. Sportsmanship and FUN!! Above all, this league is for FUN and the enjoyment of all those involved. NIS and its officials will eject/expel players for inappropriate behavior. In addition, NIS will remove any players and/or teams who cannot adhere to its policies and standards without refund.